Greg McKeown is emerging as one of the most refreshing and transformative business thought leaders and speakers on leadership, peak performance, and business growth. He is a NYT and WSJ best-selling author, founder and CEO of THIS Inc.—a leadership and strategy design agency in Silicon Valley—and one of the most popular writers for Harvard Business Review and LinkedIn’s Influencer Group. McKeown has dedicated his career to discovering why some people break through to the next level—and others do not. He is distinguished for reviving the essence of what it means to create a life that truly matters. Greg’s Essentialism message surfaced from a painful life-lesson learned the day his daughter was born. Caught between the instinctive fatherly desire to stay with his wife and new baby, and the pressures of a demanding job, Greg made the choice to leave the hospital and attend a client meeting. Shortly after the appointment, Greg recognized that he had made a fool’s bargain. He had been untrue to himself and had let the expectations and schedule of someone else prioritize his life. In trying to keep everyone happy, he had sacrificed what mattered most. Gail Davis: Greg McKeown is the author of the New York Times and Wall Street Journal bestseller Essentialism, The Disciplined Pursuit of Less, and speaks at companies including Apple, Facebook, Google, LinkedIn, Salesforce.com, and Twitter. [00:01:00] He's among the most popular bloggers for the Harvard Business Review and LinkedIn's Influencers. He is the co-creator of the popular course, "Designing Life, Essentially" at Stanford University, and serves as a young global leader for the World Economic Forum. Please welcome today's guest to GDA Podcast, Greg McKeown. Kyle Davis: Hey Greg, how are you? Greg McKeown: Fantastic. It's great to be with you. Kyle Davis: It's a pleasure to have you on. Gail Davis: Greg, when I saw [00:01:30] that you were confirmed for recording today, I had to immediately go grab my own personal copy of your book, which is highlighted from cover to cover. I absolutely love this book. It really spoke to me probably most on the very back, because I just can't imagine anyone that doesn't relate to this, but it says, "Have you ever found yourself stretched too thin at home or at work? Have you ever felt both overworked and underutilized? Do you ever feel busy but not productive? Do you ever [00:02:00] feel like you're constantly in motion but never getting anywhere?" And it says if you've answered yes to any of those, then you need essentialism. So, I think this is going to be a great conversation today. Greg McKeown: That's so great that you have really wrestled with these ideas and that's just the beginning for everyone, because we're all strugglers, we're all feeling some of this challenge of being pulled in too many directions and having people maybe hijack our agenda each day. So I think this [00:02:30] is in the zeitgeist. This is relevant for ... it appears for a lot of people, and more people than I realized when I wrote the book. Gail Davis: Speaking to the point that everyone struggles with it, the way that I first learned about your material was actually speaking with a client, and he asked me if I had read the book. It was when it first came out, and I said, "No, I haven't," and he goes, "Well, I want you to buy it today, and call me when you're finished," and that's how I first tracked you down and found you. I know there's a big need, and we've since [00:03:00] worked together many times. How about, for our listeners, why don't you just kind of start with how you came upon this. You gave us before recording a really eloquent definition of what essentialism is. Greg McKeown: Well, let's just get to the definition first, right. Essentialism is the disciplined pursuit of less but better, and it stands in complete contrast to what is the dominant [00:03:30] norm of our times, which is non-essentialism, or the undisciplined pursuit of more. And I kind of crossed this contrast when I was doing two things at once. I was working with Silicon Valley companies who seemed to go through this very natural, very predictable, simple path, this problematic path that they were focused on the right few things at the right time at the beginning, very simple and clear [00:04:00] that became successful. Success increased options and opportunities so fast that it led to this undisciplined pursuit of more. What I had noticed again and again was this passing that could undermine the very things that led to success in the first place. So even though success was something these companies were pursuing and wanted to have, it turned out that it could become a catalyst for failure if they weren't careful. So that's sort [00:04:30] of what I observed on one hand, and at the same time, I had an experience myself where, on the personal level ... So I was observing at the professional space, but on the personal level, I remember I got an email from my boss at the time that said, "Friday would be a very bad time for your wife to have a baby, because I need you to be at this client meeting," and I'm sure they were joking, and I'm sure most of what follows is [00:05:00] on my head, but I felt torn. So when late, late Thursday night, middle of the night, our daughter is born, I was feeling torn. How can I do both? Can I keep everybody happy? And to my shame, I went to the meeting, and afterwards I remember my boss said, "Well, the client will respect you for the choice you make." And I don't know that they did, but even if they did, surely I've made a fool's bargain, and I could see this simple lesson, [00:05:30] which is if you don't prioritize your life, then someone else will. And that was, at least in hindsight, where these professional insights, the strategy work I was doing with companies, and this personal strategy work suddenly connected. And I realized, this is true at the organization level but it is also true at the individual level. And what we're seeing here is a problem that needs a solution. And so I invested [00:06:00] the years to try and understand the phenomenon, understand what's causing it, and also try and understand what we can do about it. Kyle Davis: I love the quote that you just said that, if you don't prioritize your life, someone else will, and I understand kind of ... I worked in Silicon Valley for a few tech companies and also in New York as well and ... I've worked with two that worked in the same space basically making the same product, and one had a laser focus on design and simplicity and customers would say, "Hey, we [00:06:30] really want this," and they'd go, "Well, we're thinking about it, and we'll get there." At the end of the day, they're still around. Huge IPO and big, big company. The other company, the moment they got success and they got traction and the customer said, "Hey, we want this, we want that," they just had this divergent point. They just started doing everything and they tried to be everything for everybody, and they're no longer around anymore. So I get it from a business standpoint, but I also can start to kind of formulate how it works personally as well. Greg McKeown: Well, and what you just said is as succinct a summary as [00:07:00] I heard anywhere. That's exactly the argument, is that success doesn't, as it sort of ought to do, at least logically, it doesn't produce success and success and success, because there is this ... How might I say it, a fault in our stars. A logical misstep in the way we think about things that only becomes clear [00:07:30] as we experience a level of success, and so the logical undercurrent is that this idea, this is what non-essentialism is, it's an idea. And the idea is, you have to do it all. By doing everything perfect now, you're going to get everything you want. And that all sounds right. Yes, okay, if you could just do everything perfect now, you'll get everything you possibly want, and that sounds right. It shows you how wrong our logic is. The [00:08:00] problem is that it doesn't work. If you're trying to do everything for every customer and do it all and thoughtless ... If you're trying to do everything for everyone without thinking about it, you don't get everything you want. You get stress, you get discombobulation, your whole system, whether it's a company or your life, it starts to not work. And so, it's one of the great comes of our time, that we've been sold and have been bought into, [00:08:30] what turns out to be a bit of birds. Kyle Davis: Yeah, I think scope creep is a real thing, and people, they have this idea, they have this in the nascent stages of what it is a company or relationship is, it's something super simple, but as time goes on, they allow the complexities of life or the wisdom of others to influence what it is that they should do. And if they're not focused on what they're doing and they listen to others or have outside [00:09:00] influence or something like that, it becomes scatterbrained and they fizzle out. Greg McKeown: Well, I was working with somebody who was an executive in a firm doing superb work, award-winning work, partially as result of the success ... The company he's working for got purchased by a larger more bureaucratic firm, goes into that company, he wants to be a good team player, he wants to be liked, and he wants to make a contribution. [00:09:30] All of those motivations sound about right, but what it meant was that in practice he was saying yes to everyone and everything without really thinking about it. And that meant that in this more bureaucratic firm and environment, he's being invited to far more meetings than he can sanely take. He's just ending up being stretched too thin, he ends up making these little bits of progress in many different directions instead of proper contribution, and he almost quits [00:10:00] the company until someone says, "Look, what you need to do is take on a new mindset," which they described a little ugly as, you need to retire in your current role. And that meant you need to imagine that you were only ... Unless the company would be hired again, but now only as a consultant and as an outsider. And you're only going to be paid for the results that you produce, and suddenly he's like, "Right, yes, of course. I know this, I've just forgotten this, that [00:10:30] it's about being thoughtful and careful and selective." So by the end of that year, he was surprised to find that his performance evaluations had gone up. So as he's become more selective, he had actually made a better contribution. He found that he got one of the largest bonuses of his whole career at the end of that year, and maybe ... Well, it's not just maybe, but certainly more important even, where is that he said that, "Look, I really got my life back. I was eating dinner with my wife again [00:11:00] at night, so I was going to the gym. My life had a sense of, it was centered in what was important and what was essential." And you can see again in that illustration the same idea that non-essentialism is a con, and it just doesn't work and it doesn't help people to break through to the next level. It plateaus people in their progress and even has them fail altogether. Kyle Davis: I'm curious as [00:11:30] to where you think maybe this lack of discipline comes from? Or is it just kind of an innate thing that we fall into? And then, the next evolution of that, what is discipline to you and how can people harness their discipline powers? Greg McKeown: Well, I think let's start with this idea that, basically we wake up in the morning with a certain amount of discipline, and that over time one can increase that amount. You can [00:12:00] increase your discipline currency, the coinage that you're given. But it takes some time. So, on a given day, you have an x amount. The question is how well you'll use it. The times in which we live ask us to use it in a reactive, noisy, distributed way. So we wake up, people checking email ... I [00:12:30] just did an episode with Steve Harvey, with the Steve Harvey Show where we identify somebody from his audience and I went to her house and we both spent the day together and looked at her life, and one of the things that she admited to is that she slept with her phone underneath her pillow. So as soon as she get an email or a text, she you she would take that out and she would respond to it, and then try and go back to sleep. So that's [00:13:00] sort of the environment that we're in. So we would use our finite amount of discipline in these very reactive ways because of this unholy alliance between social media and smartphones and sort of extreme consumerism that's in our era. So that's the environment that we're in. The path of least resistance will be to use up our discipline in this way. So what it means is that by 11 o'clock in the morning, we're experiencing [00:13:30] decision fatigue, which means that we've used up that discipline, reacting to emails and texts and all of this noise and just social media and the latest news alerts that are coming through our phones. So we've used up the discipline that we had, and then therefore we will spend the rest of the day in continued reactivity. So that's where we are. I don't think it's quite right to think that we're less disciplined today than in any other era. It's that the [00:14:00] tools we've created and the environment that we've created use up our discipline in an inefficient way. It feels like we're going fast when we're reacting like that, but actually, the things that matter, aren't going fast at all. So you can imagine whole team cultures and company cultures that get into this non-essentialism addiction, and they're just not actually building any momentum. What people are actually experiencing is motion sickness. [00:14:30] So given that reality, the question is, the essentialist doesn't have, in this sense, any more discipline than a non-essentialist. They're just using that discipline differently. So if you use your discipline to create a system, a routine, a way of living or a way of operating that protects that discipline ... So you're trying to make decisions at one time for your whole life. You decide, "Okay, I'm going to get up and I'm going to not check my phone first. I'm going to read wisdom literature, and be still, [00:15:00] and get centered. And I'm going to try and make my ... Top few things that I'm going to identify that day, and I'm going to put it in priority order." And these become part of the routine of our lives, so we build in routine so that we're using as little of our discipline as possible each day. We're not trying to remake our decisions and exhaust ourselves. We're trying to use the discipline that we have in the most [00:15:30] thoughtful ways. That to me is how to think about discipline and undiscipline. This is non-essentialism and essentialism. Kyle Davis: It's intentional and it's more proactive, 'cause you're not reacting to what's coming at you, instead you're just plotting your course as you have planned it already. Greg McKeown: Yes, and I think that one of the things that I've learned post the book even is just pausing. We're not saying that ... I'm not necessarily arguing to people, "Well, you should just start saying no to everyone and everything." In fact, I'm not arguing that. That would be a different book, that would be a book called Noism. [00:16:30] And it's somebody else's book. They need to write that. What I'm writing ... What I wrote is Essentialism. And that means one has to at least pause. Instead of just reacting into the day, and never ... it's not just saying no to other people, it's just things, ideas that come to us, and we go, "Hey, here's an idea." There are people in my life who even ... It appears to me that the space between thought and emailing to me, is almost nonexistent. [00:17:00] Email will arrive before they've even thought about what they've sent. And then they'll send the second one to go, "Oh, hold on, I didn't really think about that." And sometimes even a third one, as they suddenly think about what they've just said. The tools we have have been built on the idea of speed being great, but they haven't been great at helping us to pause. So we have to make sure that these [00:17:30] tools in our lives are servants to us and not our masters, not helping us to ... enabling us to run faster than our thought, faster than our perception, faster than our wisdom. Pausing just even a moment. If we never pause right now, and we start to pause even half a second before we do a thing, that's a step towards this freedom. And then you move out, and eventually you get to the point where you say, "No, I'm going to create some space, I'm going to create a minute, five [00:18:00] minutes, ten minutes. I'm going to create half an hour of space. So I'm not going to check my email until I've thought about this." People these days are checking their phones an average 150 times a day. So at the highest levels, that's like 900 times a day. This is immensely reactive way of living and thinking. An essentialist starts small by creating little moments of space to [00:18:30] think, to pause, to reflect, so that they can figure out what actually matters, so that they can focus on those things. Gail Davis: Greg, I'd like to talk about the conflict many people have when you're in a service business, or when you're in sales, in that whole, early bird gets the worm or, someone reaches out, you've got to be uber-responsive. I had a 20-year career in a service industry and the mentality was, "We're not selling widgets, we're selling a service, so [00:19:00] we've got to be available 24/7, seven days a week." That was really ingrained in me, and now, starting my own company, I know I've brought a lot of that in. If the client wants something, we've got to be available. How do you balance wanting to provide good service, knowing that you're in a service industry, but also putting some kind of a boundary around it so that you don't burn your team out? Greg McKeown: Well, let's begin [00:19:30] with the idea that essentialism is not about being less helpful to people. Essentialism is about being the most helpful you can be. So that question becomes, how can you be the most helpful you can be? What's the best way to do that? Is it to be on 24/7? Because if it is, then that's what you should do, and you should have your whole team do that, if that's the way to break through to the next level of contribution. [00:20:00] If that's the way to become more successful than you've been in the past, then do it. So, the question is, is it? That's what we should ask. Sometimes I'll play the devil's advocate on this and I'll take on the role of a non-essentialist and try and push people on the logic that they're really in a way trying to advocate to me. I'll go all the way and say, "Fine, stop sleeping. Stop sleeping." And I'm being so serious, [00:20:30] you can't imagine. So if 24/7 is the key to success in your industry, if that's how to create the best level of service, stop sleeping. Stop exercising, eat one time a day. Take every call, make every email, don't think about any of it. Just whatever they want, whenever they want, regardless of what the fees people are paying, regardless of whether they're good customers, regardless of whether they're high-maintenance, just go all the way. If non-essentialism is a great [00:21:00] idea, double down on it. As I do this, people start, in general, to feel a little uncomfortable because they feel, well, that doesn't make any sense to me. And they are not so sure they want to double down on non-essentialism. They just think that what they've been taught to do is the way to do it. And they're too scared to experiment with something else, to believe that there might be an alternative path that actually leads to the next level of contribution. [00:21:30] And that is scary. In fact, what's it requires is to become a leader. To actually figure things out. What really is our business model? And how do we really make money? And how would we make 10 times the money we're making on half the level of stress in work? That suddenly becomes a powerful question. That's the kind [00:22:00] of question an essentialist would ask. And it challenges the way of thinking. You can't solve that question by doubling down on non-essentialism. You have to actually think better, you have to think deeper, you have to have different kinds of conversations, and in the process you can break out of the cycle that you've been in. Gail Davis: I remember your book has a chapter called The Graceful No, and after I read it, I once landed in Aspen for a weekend, [00:22:30] and I had an email from my largest client, asking me for something. And so the very first thing I felt in my body was complete stress like, "How soon can I get to Wi-Fi? How soon can I log on? How soon can I handle this?" And instead, I responded, "Hey, I just landed in Colorado. I'm going to be here for three days, would it be okay for me to get this to you on Tuesday?" And her response back was, "Perfect, have a great weekend." Gail Davis: Yeah, and I thought, "What?" [00:23:00] So I learned that it can work. I think actually, to your point, people might even respect you a little bit better that you're occasionally recharging, but it's a new concept, and just learning that graceful tool, I loved that chapter, The Graceful No. I loved that. Greg McKeown: Go ahead, what were you going to say? Kyle Davis: It's a race to the bottom. Greg McKeown: It's a race to the bottom, precisely. It's how to have less profit, it's how to have higher competition, and it's a way to have your life be out of control but be increasingly devalued by the people coming to you. So, that's a strategy, [00:24:00] right? That's fine, double down on it if you think it works and you believe in it. I'm not arguing that we should stop hustling. I'm saying that we should hustle for less but better, that we should say, "Well, what is the way I can get to the point? How can I go from here where I am to a point where the customers I have, the clients I have, are high-quality clients who respect how I work and I get great results for them, they have great results for me, and we have an understanding, [00:24:30] so that they know I'll be responsive. They know I'm not disappearing on them. They know that I will respond and be communicative with them, but I'm not going to be just so reactive that there's no thinking going on." And so, I love that example, you're selling me on it. Kyle Davis: I had a similar example. When I was out in San Francisco, I had a friend of mine who I worked with, and he [00:25:00] was always worried about making his numbers, which he always made, blow them out of the water. But he was always worried about it, and we had one of these kind of get-togethers that starts at 5:30 and the next thing you know, it's 10:30 and you're in a bar. And he gets an email from a client, and he starts to type up, and I'm like, "What are you doing? They're two hours ahead of you, it's a restaurant that's emailing you. They're only emailing you now because this is when they have free time, they're not expecting you to reply." And I'm just like thinking in my head, " [00:25:30] If this is 1995, you wouldn't have a computer in your pocket, and they wouldn't be calling your cellphone." So there's no need to respond, you can just simply say, "I've got your email, I'll give you a full response tomorrow," or just not respond at all, and then reply tomorrow. Greg McKeown: Yes, I think that there's ... What we're describing here in lots of ways is new learning. It's new experiments. I don't all the answers. There's lots of answers in essentialism, specific ways to be able to gracefully [00:26:00] negotiate non-essentials, gracefully say no for if we have these conversations. There are lots of specifics in there, but I also think it's about learning how to thrive in this new normal, and not just doing what everybody else is doing. That's not a strategy. Or at least it might be, but not a very thoughtful one. Kyle Davis: Yeah, like I said, it's a race to the bottom, and you I think hit the nail on the head. It devalues who you are kind of [00:26:30] as a person, whether you're an order-taker or somebody who wants to be kind of a valued consultant or advisor. Pivoting from this, and in those moments that you pause and can really think about your day or think about what's next, how can people do a better job of really focusing on those key things, the things that really matter, the things that drive business, that build relationships. What can do they do to help focus on those or maybe to come back into alignment on the things that matter? Greg McKeown: Well, one of the things that I think [00:27:00] people can do, and it's consistent with this, is starting with a small portion and increasing it. I recommend that people hold their personal quarterly offsite. They can do that right now. They can pause this podcast for a second, schedule out every 90 days to put on repeat for the next year, and protect one day each 90 days to go through a process of reflection. The goal of those is to come out with a high level of clarity [00:27:30] about ... Well hopefully, about the most important single thing that you're going to pursue over the next 90 days. I don't mean you only are going to have one thing that you pursue, but that you do identify, "If I only got one thing done, what would it be? What's that thing that will be most significant in accelerating the things that matter the most to me?" My wife and I started doing this a couple of years ago, and [00:28:00] there are literally ... The things that we have ended up doing over these two years have been materially different than that would've been without that process. As a part of that process, let me just describe something I learned but I didn't know when I wrote the book, I couldn't know when I was co-creating the process at Stanford, but I learned post that, which is, we have to think very long-term indeed if we want to understand and discern the difference between the good things in our lives and the [00:28:30] truly vitally essential things. Normally, I used to think, "Well, long term think, 10 years is long term think isn't it? That's long." And then when I co-created the class at Stanford it was, where we did birth 'till death, that's long-term thinking, isn't it? And now I realize, and when we started doing this personal quarterly offsites, I realized that is necessary but completely insufficient. In fact, it is incredibly one self wide, and one self deep way [00:29:00] of thinking. If I only think about the narrative of my life, from the day I was born to the day I'm done, I'm not thinking about what's really essential. I'm just thinking about my minute existence here on earth. What I need and what I've now worked and continued to develop is a 100-year vision. 100 years before my life, and 100 years afterwards. This is one of the things that I've done in these personal quarterly offsites. So I've actually started to [00:29:30] write down and learn and research, "Okay, what happened ... What did the people 100 years before us do?" So this is great grandparents. At first, I can't even you their names, and most people can't. They can't even tell their names, I think that's so striking, so shocking to see at this point. These are the people that defined us, that shaped us, that affected us, and we don't even know their names. We don't even know their birthdays, and yet they have [00:30:00] massively influenced us. And similarly, when we go forward 100 years from now, so that's after us. We're not here anymore. We have our grandchildren, our great-grandchildren, and maybe you can even apply the same very long-term thinking to business. In fact, just yesterday a keynote for a group from Nike, and I shared this idea of the 100-year vision with them, and I wondered how they would react. I thought maybe they'd, "Well, that's fine [00:30:30] for a personal life, but here in business we got quarterly results and all the rest of it." They came to be afterwards and said, "There's a group at Nike that started a program called N7. N7. What it stands for is seven generations. This is, "What is the impact of what we're doing seven generations from now?" That is powerful. If every quarter, and I don't mean you spend the whole day in that very, very long-term thinking, but that you touched that, [00:31:00] like a touchstone. You reflect on that again, what has lasted 100 years, what will last 100 years from now, and then you start to connect your essential intent, meaning your next sort of couple of years, what the big goal is, and you connect that to your 90-day goal, well, suddenly, you've got something that you can keep coming back to. Instead of letting an email dictate your life, which, of course, we can be responsive to email and to our customers and so on, but you don't [00:31:30] just have that as your guidepost in life. You additionally have this long connection to this much longer term intent in life. To me, that combination of being responsive in the now but also having this very deliberate long-term intent, really work together to create an essentialist way of living. Kyle Davis: I'm reminded of ... When I was working at Square, which is a Jack Dorsey company. [00:32:00] He had written a 5000-year manifesto as to where commerce will be 5000 years from now, and a lot of people gave him grief for it, but it's kind of to your point. He's thinking beyond the present and saying, "Hey, this is where things could go, and how things might go." To your point of kind of thinking about the things that matter, one of the last companies that I worked for when I was in New York, what we would do is every quarter, we would think about the three things that we really wanted to focus on for the quarter. And then we had monthly objectives, [00:32:30] but they to feed to those three things that we did. And we had weekly objectives that had to feed to the monthly that had to feed to the end, and then the daily goals. It just allowed us to stay laser-focused on that end pursuit, so that every quarter we hit those target things that we were working towards, and it wasn't sales stuff, it was other stuff. Greg McKeown: Right. There you have it exactly. So if you connect the two ideas, you connect Dorsey's idea there at the front, 5000 years from now, with that strategic [00:33:00] process that the company in New York held, there is a way to kind of combine those ideas where you're feeding into your 90-day objectives, your two to three things that you think really matter. You're feeding into it something that would not normally make it onto your goal list at all, and that's so important. Essentialism isn't about not officially doing what's on your to-do list. It's about making sure that essential items make it onto your to-do list [00:33:30] at all. And that's an important distinguishing feature. It's about not doing more ... It's not they're doing more things, it's just that they're doing more of the right things. Kyle Davis: Yeah, I had a friend of mine who was in the military and he basically explained to me, and it was rather profound. He said, "Tactics don't win wars." And what does that mean? When people see Navy Seals clearing out a building, those are tactical maneuvers, but that's an [00:34:00] isolated event and a location, but it doesn't win the long-term wars. Strategy wins the war. And there's so much to it than the day-to-day actions, and so you have to have this long-term vision as to how you get to somewhere, and then the tactics are just kind of used in the here and now. Greg McKeown: When you go back as I've been doing recently, in fact experiencing a bit of a Renaissance, a personal Renaissance recently of ... As I've been reading the [00:34:30] founding fathers, of reading David McCullough's fabulous biography of John Adams and also his more recent book, The Spirit of America, as well as a series of his speeches ... As I'm reading about them, and I'm thinking about, back to Adams, the intent, the strategic intent. Talk about a 100-year [00:35:00] vision. He's saying, "Look, I want to live now." Abigail and he are going through this sacrificial trial period. They're clearly essentialists. They clearly are making trade-offs in pursuit of building a country that outlives them. They're building something that just doesn't outlive them but outlives the normal longevity of countries, and to build something special, to build an independence, to build the people not [00:35:30] governed by kings, by monarchy, by single individuals with all the power. This is consistent when Dorsey is giving a hard time for his 5000-year vision or similarly the founder of Amazon who has invested an enormous amount of money in building the 10,000 hour clock, which is an actual project where they're building [00:36:00] a 10,000 hour clock into a mountain. Instead of what would be the minute hand on a clock normally, it will take a full year and it will take 100 years for that arm to go around 360 on the clock. So this will take 10,000 hours to go from beginning to end. Why is he doing it? What's the point? What's the ... It's more than just symbolic. It's helping to challenge us to believe that we can think differently, think really [00:36:30] long-term, therefore be able to better answer the question what's important now. And that's sort of where essentialism leads to cutting-edge of execution. It has a nice acronym, win to win. What's important now? You do these 90-day offsites, you do this process, you create space in your life so that you can answer that question, what's important now, so that you're not just reactive to any win that you have or other people have for you, so [00:37:00] that you end up adding these meaningful moments together, weaving them together, and therefore live a meaningful quarter, meaningful year, meaningful life. That's the idea. Kyle Davis: Well, I'd dig it. It reminds me of a company that I used to work for whose slogan was, "We're something something that's built to last, beyond us," and I think people can kind of humble themselves and pause, like you said, for a moment, for [00:37:30] a day, for a time, and really think about what's going forward and the secondary and tertiary and ... I don't know the fourth one but I know it's a fourth-order effect, what it is, what are the results and what's the spin-off going to be, and it allows you to really be able to plot your own course rather than falling victim to the wind. Greg McKeown: Yes, I think that's true, and I want to hold a distinguishing, additional thing, which I think is embedded in your story, but I want to make it exclusive, which is [00:38:00] that it just isn't more self-centered. The idea that if you don't prioritize your life, someone else will, could be interpreted to mean, "Well, I just got to do what I want and let everybody else be on their own. This is a self-centered strategy." And it could lend itself to that, but I don't believe essentialism is this at all. I think it's about ... The very idea that it's what's most important means it's what'll last the longest. It means it's what impacts people [00:38:30] for good, and the question is, "What is my highest point of contribution? And how can I live in that? How can I pursue that?" And so in a way it's all about reducing the ego which clutters our mind and hides what's important. It's like Gandhi. When I was in South Africa recently doing a keynote, a major keynote. Thousands [00:39:00] of people were in the urban South Africa, and I take some time, a couple of hours out of that to go to the Phoenix Settlement, which is where Gandhi lived for 23 years when he first began his experiments with truth and his civil disobedience. What had happened is that he was going to a barrister at England, and he did become a barrister but he would've stayed there, but he had a family emergency come up in South Africa. He goes to South Africa, he gets kicked [00:39:30] off the train. And he's attuned enough by that point in his life, to his conscience, to his own voice, that realizes, this is important, this is a defining moment. He takes to take on the South African government, and he stays longer than he expected, which is, how I think almost all projects go, and 23 years later, he is successful. So that is what begins his journey. By the time he goes back to India, people have heard about him, he's [00:40:00] become successful, and this is another key moment. Instead of doing what they wanted, which is run for office, become an officer in government, become the prime minster. Instead of being seduced by that part, the reactive, non-essentialist part, he said, "No, I don't really understand the system here. Just because I'm used to South Africa, doesn't mean I understand it here. I need to understand how it is that so few of you British can control so many Indians so effortlessly, and I don't [00:40:30] understand that yet." So he takes a year of his life ... We're talking the middle of his life. One whole year, to listen, to understand, to see the big picture. We talk about creating space to understand what matters, and he finds the answer is infinitesimally small, infinitely important. It's salt, salt. The British control the production of salt, therefore the whole food chain, and this is one of the key mechanisms by which they control the Indian [00:41:00] people. So that's how the idea was borne for him, to walk across India in a demonstration of civil disobedience, to make salt on the beaches, that became known as, you can imagine, as the Salt Marches. And what's curious and extraordinary is that 600,000 people followed him across India. So he has clearly identified the right issue, that's the power of identifying what really matters, and this begins these experiments that, of course we know proved to be successful in bringing independence to the largest democracy in the world. [00:41:30] Well, back to this keynote back in South Africa, I take these two hours, go to the Phoenix Settlement, go to the house where he lived for 23 years, and was given what I was told was the only poem that he had ever written, and found in that poem a succinct a summary to essentialism I found anywhere. The words were these, "Reducing oneself to zero." Reducing oneself to zero. 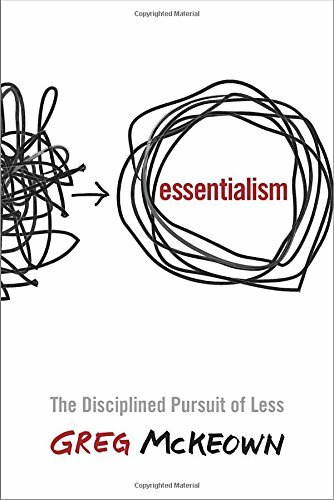 Essentialism is not the pursuit of more selfishness. It's not [00:42:00] to singularly pursue what is in one's self interest. No, it is to reduce oneself to zero and instead to be consumed with the highest and noblest, best purpose of our lives. To discern that and to give ourself for that. And that is precisely what then gives us the moral confidence, conviction, and right, to say to the nonessential. If you really have identified something that is more important, [00:42:30] you are morally obligated to not produce something that is less valuable, less important, less contributing to the people around you. And so that's what gives us courage, that clarity of purpose is what gives us courage, to be able to learn the new skills and to be able to be then experiment, win them as graceful as possible with other people so that we can ultimately pursue that course that matters most. Kyle Davis: Well, I think that is a good place for us to wrap [00:43:00] up, but I'd like to kind of go back to the phrase you said, which was, "If you don't prioritize your life, someone else will." I was just thinking about that and you can change that word life and you can change it to ... If you don't prioritize your team, someone else will, or your business or your relationship, or ultimately Gandhi, your purpose. So I think that's kind of a good thing for people to focus in on and really think about. Greg McKeown: Yeah, I love that. Gail Davis: It's been really great Greg. Thank you so much. Gail Davis: It's been really great. It's been very, very inspiring. Kyle Davis: Cool. Hey, if you want to have Greg McKeown come and speak for your event, you can do so by contacting GDA Speakers. The phone number's 214-420-1999. The website's gdaspeakers.com. For the transcript and an ability to get the book and everything else, you can go to gdapodcast.com. Other than that, Greg, it's been amazing, thank you. Greg McKeown: [00:44:00] Thank you ever so much. Thank you.